A female dentist treating a patient. A modern and brightly colored dentist's office in 2009. 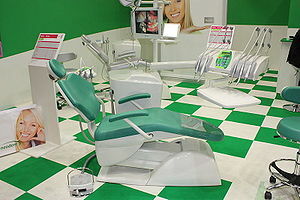 Dentists tend to work in the safety of an office environment. However, work-related injuries can occur, such as the use of hand-held tools when performing dental work on patients causing an accident. There is a great variety of dentist equipment. Their offices are equipped with brushes, drills, forceps, mouth mirrors, probes, scalpels, and x-ray machines. Sometimes, dentists may also have computer technologies such as lasers and digital scanners to use when treating their patients. Dentists must also wear certain clothes to protect the patients and themselves from any harmful bacteria that is coming from the other person. The variety of things that dentists may wear are masks, gloves, and safety glasses. This is typical dress for a dentist. In all fifty of the United States of America, as well as the District of Columbia, dentists are required to be licensed. In most of the States, candidates wanting to qualify for a license must graduate from an accredited dental school and pass written and practical examinations. 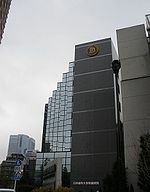 The Nippon Dental University School of Dentistry in Tokyo. As currently as 2008, there are fifty-seven dental schools in the United States that are accredited by the American Dental Association's (ADA's) Commission on Dental Accreditation. Dental schools require students to have two years of college-level pre-dental education prior to their admittance. Most students in dental college have at least a bachelor's degree before entering, although there are sometimes a rare few who are accepted into dental school after only two or three years of college and then complete their bachelor's degree while attending dental school. According to the ADA, about 85% of the dental students in the 2006-07 academic year had a bachelor’s degree prior to beginning their dental program. Another qualification that applicants must meet is to take the Dental Admissions Test, or the DAT. When the dental colleges are selecting students for matriculation, they consider the scores earned on the DAT, the applicants' grade point averages, and the information gathered through recommendations and interviews with the students. There is a large amount of competition to enter into dental schools, and the stakes are high. Students are usually in dental school for four academic years. The students' studies begin with classroom instruction and laboratory work in science, which includes anatomy, biochemistry, microbiology, and physiology. They are also taught clinical sciences, which includes laboratory techniques. More recently, students have been given the opportunity to treat patients in dental clinics, under the supervision of licensed dentists. 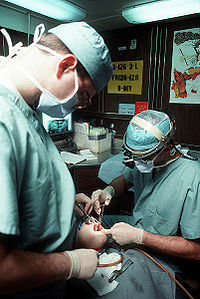 After the graduating students have passed the exams and received a Doctor of Dental Surgery (DDS) or Doctor of Dental Medicine (DDM) degree,   they may choose to either apprentice under an established practitioner for many years and eventually buy a larger share of the partnership, or they can start their own practices. About 25% of graduating students buy into or purchase an existing practice of their own. Rarely is financing a problem, since dental practices are considered good investments by most banks, as long as the internal cash flow of the practice is properly managed. All practicing dentists are required by law to be licensed. In most of the United States, dental licensure requires the applicant to pass both written and practical examinations in addition to having a degree from an accredited dental school. Candidates may fulfill the written part of the State licensing requirements by passing the National Board Dental Examinations. Individual States or regional testing agencies administer the written or practical examinations. Licensed individuals are permitted to practice any of the nine recognized specialties in all fifty United States and the District of Columbia. The requirements include two to four years of postgraduate education and, in certain cases, the completion of a special state examination. Another possible requirement is a postgraduate residency term which usually lasts up to two years. Most U.S. licenses permit dentists to engage in both general and specialized practice. Dental surgery onboard the U.S.S. Eisenhower. In 2008, dentists held about 141,900 jobs in America. About 120,200 of those jobs were dentists who were general practitioners, 7,700 were taken by orthodontists, 6,700 by oral and maxillofacial surgeons, only 500 by prosthodontists, and another 6,900 by all other dentist specialists. About 15% of these dentists were specialists, and 28% were self-employed and not incorporated. Almost all of the dentists were working in a private practice, and very few of these salaried dentists worked in a physician's office or a hospital. Based on the information from ADA, about three out of four dentists in private practice were solo proprietors, and only 15% belonged to a partnership. Dentists tend to work about four or five days a week. If necessary, a dentist can work evenings and weekends to meet a patient's needs. The number of hours that a dentist works really depends on the amount of patients that he/she has, and how much work they need done. If a dentist is working full time, they tend to spend about thirty-five to forty hours per week in their office,  working about seven to ten hour days. However, if a dentist is just establishing their practice and does not have any patients, they work even more hours than this. In contrast, experienced dentists work fewer hours than a full time dentist. It is not uncommon for a dentist to continue in a part-time practice well beyond the usual age of retirement. The average annual wage of a salaried dentist is about $142,870 a year, as of May 2008 according to ADA. The average has also been reported as high as $204,500 a year,  and as low as $129,920 a year. The earnings of a dentist can vary due to the number of years that they have been in practice, their location, how many hours they have worked, and their specialty. Dentists that are self-employed tend to earn more money than salaried dentists do. 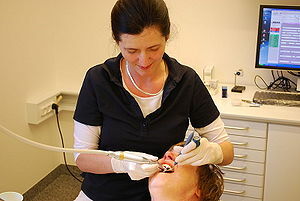 However, dentists who are salaried often receive benefits that are paid by their employer, with health insurance and malpractice insurance being among the most common, while self-employed dentists must provide their own health insurance, life insurance, retirement plans, and other benefits. Orthodontists- the largest of the nine speciality groups. They are responsible for straightening their patients' teeth by applying pressure to them with braces or other appliances. Oral/Maxillofacial Surgeons- the second largest group of specialists. They operate on the gums, head, jaws, mouth, neck, and teeth. Pediatric Dentists- dentists that focus on children and special-needs patients. Periodontists- dentists that treat bone supporting teeth and gums. Prosthodontists- dentists that replace missing teeth with permanent fixtures, such as crowns and bridges, or with removable fixtures, such as dentures. Endodontists- dentists that perform root-canal therapy. Oral Pathologists- dentists that diagnose oral diseases. Oral/Maxillofacial Radiologists- dentists that diagnose diseases in the head and neck through the use of imaging technologies. Dentists that have a private practice tend to oversee a great variety of administrative tasks, which includes bookkeeping and buying the right equipment and supplies. They can employ and supervise a variety of different people to help them in their office, such as dental assistants, dental hygienists, dental laboratory technicians, and receptionists. ↑ 1.00 1.01 1.02 1.03 1.04 1.05 1.06 1.07 1.08 1.09 1.10 1.11 1.12 1.13 1.14 1.15 1.16 1.17 1.18 1.19 1.20 Dentists by Bureau of Labor Statistics, U.S. Department of Labor, Occupational Outlook Handbook, 2010-11 Edition, Dentists,(visited February 25, 2010). ↑ 2.0 2.1 2.2 2.3 2.4 2.5 2.6 2.7 2.8 Dentist by The Princeton Review, Dentist,(visited February 28, 2010). ↑ 3.0 3.1 3.2 3.3 3.4 Dentist by Explore Health Careers, Career Profile, Dentist,(visited February 28, 2010). ↑ 4.0 4.1 4.2 4.3 4.4 4.5 Dentist Job Description, Career as a Dentist, Salary, Employment - Definition and Nature of the Work, Education and Training Requirements, Getting the Job by State University.com,(visited March 1, 2010). This page was last modified on 9 December 2011, at 14:25.